CaptionBot was created to showcase some of the new capabilities of Microsoft Cognitive Services. These new capabilities are the result of years of research advancements. 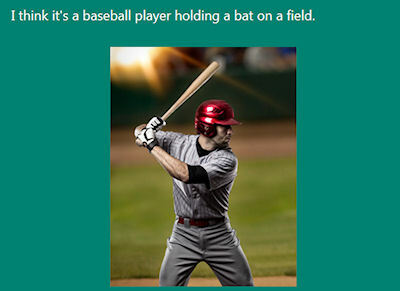 CaptionBot uses Computer Vision and Natural Language to describe contents of images. CaptionBot can understand the content of any image and the program tries to describe it as well as any human. The idea is that you upload a photo to CaptionBot, and it tries to automatically generate a caption that describes what the algorithm sees.